By pointing others to God’s loving grace, He can transform their lives. 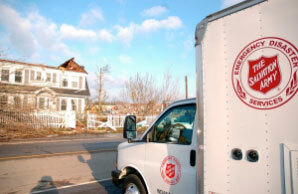 At its heart, The Salvation Army is a church. This foundation is what motivates us to do the work that we do. We love God and serve others because of His love for all. That’s where our mission comes from – to preach the gospel of Jesus Christ and to meet needs in His name without discrimination. We want to introduce the love of God into the lives of those most in need, as we care for them physically, emotionally and spiritually. We do this by offering free prayer, pastoral counseling, Bible-based ministries for all ages, and Sunday worship. We operate over 7,500 worship and service centers in neighborhoods across the United States. Each center is a church to the local community, as well as place anyone in need can receive help with a wide range of social services. Worldwide, there are just over 2 million members of The Salvation Army's church. Many more attend services at The Salvation Army. Everything we teach is rooted in God's Word, the Bible. Our organization started as an outreach of the church in Victorian England. When the East End of London was a place most people were afraid to go, William and Catherine Booth felt that God wanted them to go into this darkness and share His love. Booth was smart enough to realize that no one, "could hear a preacher if his stomach was growling more loudly from hunger than the preacher could speak!" Together, they set about meeting simple needs as living examples of God's love, with the hope that their action would be more effective than merely words. More than 150 years later, The Salvation Army has churches in 129 countries around the world. All are welcome at our Salvation Army worship services on Sundays and weekday ministries. You don't need to have ever stepped into a church before to walk through our doors. You'll find that our services are pretty informal, and even fun. We’d love to see you anytime. Preaching the Gospel of Jesus Christ and meeting human needs in His name without discrimination is our mission - and one you can be part of. With your help, we are able to help almost 30 million people per year in the U.S. alone. Worldwide, it is said that only the United Nations provides more direct social service help to individuals than The Salvation Army. Whether church is already part of your life or you are experiencing faith for the first time, you are always welcome. Each of our Worship and Service Centers in the U.S. offers a Sunday worship service, plus programming for adults and children on Sunday mornings. Contact your local center for times. We know Sundays don’t always work, so we want to make sure you have a chance to connect with other believers when you can. Most cities offer programming during the week for people of all ages — from men’s and women’s Bible studies to youth groups and character-building classes for kids. Our officers are ordained pastors and can help you work through any season in life — spiritual or emotional. They offer advice based on God’s Word and will pray with you for the strength to press on. Whether you are facing the loss of a loved one, working through legal difficulties, or just need to share with someone, you'll find someone ready to listen. Walk into any Salvation Army and you'll find someone willing to pray with you on the spot. You can also request prayer online at any time. We pray for each and every request we receive. Your generous support helps us share God’s love and care. We believe that God loves each person equally, and that Christ came to the World to make it possible for all to know God. The service we provide without discrimination is intended to provide an example—especially to those who don’t share our beliefs. When you give to The Salvation Army, you provide funding for programs that help share God’s love with those who need it most.Donate now. "While Women weep, as they do now, I'll fight; while children go hungry, as they do now I'll fight; while men go to prison, in and out, in and out, as they do now, I'll fight; while there is a poor lost girl upon the streets, while there remains one dark soul without the light of God, I’ll fight, I’ll fight to the very end!" – William Booth, Salvation Army Founder. When you give to The Salvation Army, you provide funding for programs that help us #FightForGood! Donate now.